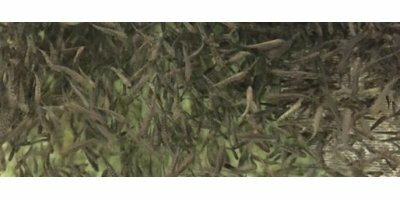 Fingerlings and Fry by Lyndon Fish Hatcheries Inc.
At Lyndon Fish Hatcheries, we produce fingerlings for a variety of customers including bioassay and toxicology labs, commercial grow-out operations as well as private stocking for ponds. Products offered range from 0.15 grams to 100 grams in size. Larger sizes can be supplied by custom order with a minimum of six months’ notice. All fish are federally certified disease free which involves having our fish tested for a number of diseases every 6 months. This allows us to ship to national and international markets. Our pristine growing conditions and strong health management practices have allowed our site to hold this certification for over a decade. A Fish Health Certificate is available upon request. Only eggs from our own breeding stock are used for fish production, giving us full control of health history and growth performance of the fish. A full health history, including all treatments applied and feed lots fed, is able to accompany each order if requested. We also value the need for continual communication on the progress of your order. If requested, we will send you a monthly update on the size and health status of your fish. Due to the high demand for our fingerlings and the time required to grow them, it is recommended that orders for fish over 5 grams are placed 18 months prior to the anticipated shipment date. No reviews were found for Fingerlings and Fry. Be the first to review!